Searching for what to do in Toronto this week? There are always cool events and exhibitions going on, but sometimes all that choice can be a little overwhelming. That’s why we’ve put together a weekly list of the most interesting art and design events going on in the city. If you missed out on what to do last week, there is still time to check out the events that are on until December. Take a look at some re-posts and new posts below! There is still time to check out The Happy Place in Toronto at the Harbourfront Centre until January 1, 2019! 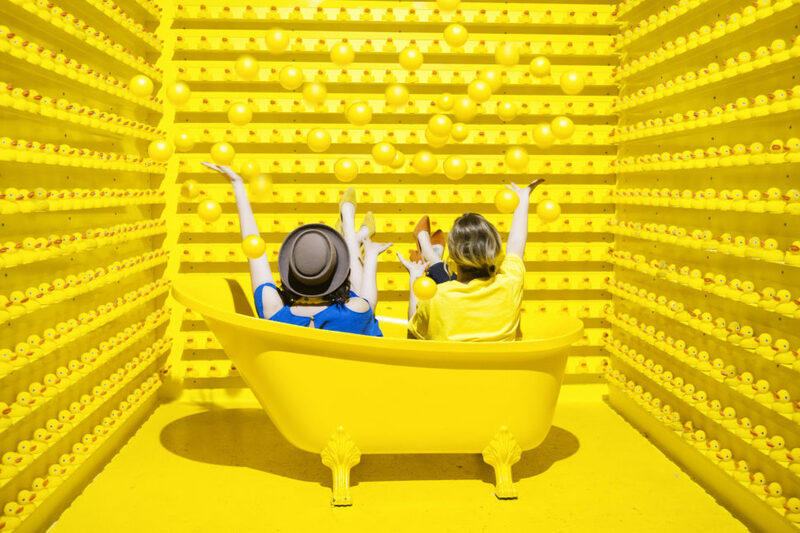 Founded by Jared Paul and opened originally on November 20, 2017, this massive pop-up experience is filled with larger than life size installations, multi-sensory immersive rooms, and dozens of moments curated to Capture Your Happy. Visited by more than 100,000 guests during our SOLD-OUT run in Los Angeles, the highly anticipated HAPPY PLACE Toronto launch will bring smiles to thousands more. Highlights include: dancing in the middle of world’s largest indoor Confetti Dome, jumping off of a larger than life double rainbow into a pot of happiness, and posing inside HAPPY PLACE’s signature rubber ducky bathtub of fun! This Christmas season, experience Canada’s Largest Winter Festival at Ontario Place! Escape to a hidden village with a beautiful skating rink, a tube park, massive light displays, a Christmas Market, amusement rides, food gardens, magical characters, and plenty of other exciting activities. Get your tickets here and embrace the winter spirit from November 29 – December 30, 2018! The One of a Kind Show or OOAK winter edition is finally here! If you love shopping locally and shopping early for Christmas gifts, this is your chance to find uniques gifts that are all under one roof. Open from November 22 – December 2, 2018, OOAK has some new things in store this year including an Exhibitor Candy Competition and a Late Night Tote Pop-up. There is also one night designated for Late Night Shopping on Thursday November 29th from 10am-11pm. So what are you waiting for? It’s on this Winter – Opening Weekend at Ontario Place! After a much needed renovation, Ontario Place if finally back up and running like the old days. This winter, Ontario Place opens its doors to a host of programs including the Winter Light Exhibition, Synthetic Ice Skating Rink, movies at the Cinesphere, Community Bonfires and more. Programs run from November 23, 2018 to March 17, 2019 and is mostly FREE! Check out their website or facebook event page for more details. This NEW festival at Harbourfront Centre includes visual arts, crafts, lecture series, markets, live music by the rink, films and unique culinary experiences. “Featuring some of the most creative driving forces in contemporary art, music and thought leadership, Norden: The Festival of Cool promises to make you think differently about the dark nights of winter.” Don’t miss out on the plethora of events starting November 24 through December 2, 2018.